EXAIR offers different styles of hoses and tubes as accessories to our product lines. They are built and designed to easily fit with our products as well as being sized correctly to not affect performance. It simplifies the use, setup, and integration of EXAIR products in your facility. You do not have to determine the proper diameters, pressure ratings, or end fittings to best fit the EXAIR products to maximize their performance. Also, having these items available from one source minimizes the number of purchases and vendors necessary for a complete and working solution. In this article, I will go over the different hoses and tubes that EXAIR can provide. The hoses above are used with our Air Operated Conveyors or Line Vacs. The Line Vacs are designed to move product from point A to point B. If the Line Vac is the “vehicle”, the Conveyance Hose is the track. The hoses are made of a durable PVC semi-flexible hose with 6 different diameters from ¾” I.D. to 3” I.D. The conveyance hose can slip easily onto the EXAIR non-threaded style of Line Vacs. EXAIR can cut-to-length Conveying Hoses up to 50 feet (15m); in increments of 10 feet (3m). To get compressed air from the piping system to the Safety Air Guns, we offer a series of Coiled Hoses. They are made of a durable abrasion-resistant nylon material that is 12 feet long (3.6 meters). They have swivel fittings to allow for easy uncoiling, and a spring strain relief to keep the hose from kinking. The coiled design makes it easy to reach around the work area and retract back to the substation. This will help to keep the hose off the ground where potential dangers could occur. We offer 3 different connection sizes of 1/8” NPT, ¼” NPT, and 3/8” NPT to attach right to the Safety Air Guns. With the proper size, the Coiled Hoses can supply the required amount of compressed air with a minimal amount of pressure drop. If you need a compressed air line to reach from overhead or around equipment, the EXAIR Compressed Air Hoses would work with these applications. They are made from a reinforced synthetic rubber in 3/8” I.D. and 1/2” I.D. diameters. We can make specific lengths up to 50 feet (15m). They are rated for 250 PSIG (17 bar) air pressure, and the hose material works well for long lasting protection against ozone, weathering and temperatures up to 158oF (70oC). They come with two male ends in ¼” NPT or ½” NPT. The Stay Set Hose gives you that possibility of manually adjusting or re-adjusting Super Air Nozzles. The hose has a “memory” function, and it will not creep or droop until you physically move it. They work well to direct air flows in specific target areas. They can be used with Super Air Nozzles, Safety Air Guns and Blow-off Kits. The Stay Set Hoses come in lengths from 6” (15cm) to 36” (91cm), and they are offered with ¼” NPT male on both ends or with a 1/8” NPT female and a ¼” NPT male connections. These hoses are rated for 250 PSIG (17 bar) and are made from reinforced synthetic rubber. If positioning is required for accurate blowing or re positioning for different areas, the Stay Set Hose would be a nice addition to your equipment. For our E-Vac product line, EXAIR offers vacuum hoses to connect the E-Vac vacuum generators to the suction cups. They are made from polyurethane in ¼” O.D. and 3/8” O.D. The tubing is very flexible for moving product, and they can resist the vacuum pressures created by the E-Vac. They slip easily into our Push-In Connectors to quickly attach vacuum cups to the E-Vac system. EXAIR can sell both types of tubing up to 50 feet (15m) in increments of 10 feet (3m). Hoses and tubes may seem like simple things, but EXAIR already did all the research in determining the best material and correct size for optimum performance. 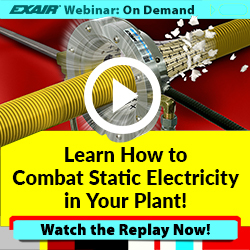 You can leverage this information to save you time and money when using EXAIR products in your application. If you need help in selecting the correct model, you can contact an Application Engineer. We will be happy to help you. I was recently contacted by a medical device manufacturer who was interested in implementing a Static Eliminator in their production process. They have a manually operated vision station where a plastic substrate, about the same size as a credit card, is placed into a nest then a small amount of liquid is deposited onto the surface. An operator takes a picture of the liquid and substrate and the image is analyzed. The part is stationary in the nest until the image is taken. When the station is done, the plastic part is manually removed from the nest. After some internal testing, they determined that static build up on the plastic part was causing the liquid to move, or “bounce” as they placed it, which was leading to a significant drop in their manufacturing yield due to faulty readings. The cycle time from taking the initial image and the analysis results is roughly 2 seconds so they were needing something that would quickly remove the charge on the plastic part. The customer was able to email some photos and after further review, EXAIR recommended they use our Gen4 Stay Set Ion Air Jet in the process. The Gen4 Ion Air Jet is a compact ionizer delivering a quiet, focused ionized air stream to quickly eliminate the static charge on the surface of a material or object. Operating at 20 PSIG, the Gen4 Ion Air Jet is capable of dissipating a 5kV charge in 0.45 seconds while maintaining a low sound level of only 67 dBA. The Ion Air Jet entrains ambient air at a rate of 5:1 and the airflow can be adjusted from a “blast” to a “breeze” simply by increasing or decreasing the inlet pressure. The Gen4 Stay Set Ion Air Jet includes our 12” Stay Set Hose which holds position until it is physically repositioned and a magnetic base for easy installation. 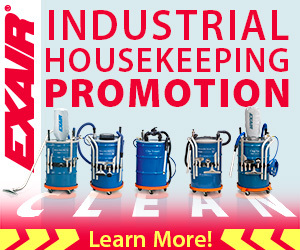 If you have an application that requires a concentrated, ionized airflow or for help with selecting the best product to fit your need, give me call at 800-903-9247 for assistance. If you work in an industrial plant or manufacturing environment, chances are you use some type of compressed air gun for cleaning parts, work areas, etc. Many air guns purchased through large industrial suppliers are a common choice due to the cost of the gun but as the saying goes – “you get what you pay for”. These types of guns may be cheap to purchase but they are also made cheap and have parts that can break easily, like the trigger or nozzle. In many cases, the nozzles on these guns are also in violation of OSHA requirements, producing dangerous discharge pressures and loud noise levels, which can lead to costly fines or potentially deadly injuries. EXAIR offers 5 different styles of Safety Air Guns that not only eliminate these concerns, but also provide a more efficient operation, which can reduce energy costs. All of our Safety Air Guns are fitted with our engineered Air Nozzles which meet OSHA Standard 1910.242(b) for 30 PSI dead end pressure, as they provide a relief or safe path for the air to exit if the nozzle were to be blocked or pressed against an operator’s body so the exiting air pressure will never reach 30 PSIG. They are also engineered to entrain surrounding air across the profile of the nozzle, which produces a smoother airflow, ultimately reducing wind shear, resulting in much lower sound levels, meeting OSHA Standard 29 CFR 1910.95(a). The Precision Safety Air Gun body is made of a durable high impact, glass reinforced nylon, providing for a lightweight, ergonomic operation. These guns feature a curved extension, ideal for delivering a powerful stream of air in hard to reach areas, like clearing debris from drilled holes. All of the nozzles used with these units are either 316ss construction for durable, corrosion resistance or PEEK plastic for non-marring applications. The air inlet is 1/4 FNPT and there is a convenient hanger available for safe storage. Our NEW VariBlast Compact Safety Air Guns are ideal for light to medium duty processes, featuring a variable flow trigger to achieve different force levels ranging from 2.0 ounces up to 1 pound, depending on the nozzle. The body is cast aluminum and there are (2) 1/4 FNPT air inlets available, 1 on the bottom and 1 on the back of the gun, as well as a storage hanger, for easy installation. Nozzles are available in zinc aluminum alloy, 303ss, 316ss and PEEK plastic. These guns are available with aluminum extensions from 6″ up to 72″. The Soft Grip Safety Air Guns are commonly used in long-term use applications as they feature a comfortable grip and long trigger which helps to reduce hand and finger fatigue. The cast aluminum construction is well suited for more rugged environments and again, features a hanger hook. These guns can be fitted with aluminum, stainless steel or PEEK plastic to meet the demands of a variety of applications and are available with 6″ – 72″ aluminum extensions for extra reach or Flexible Stay Set Hoses , allowing the user to aim the airflow to a specific target area. The air inlets for these guns are going to be 1/4 FNPT. EXAIR’s Heavy Duty Safety Air Guns deliver higher force and flows than other air guns, as these units feature a 3/8 FNPT air inlet, which maximizes the compressed air flow to the engineered Super Air Nozzle. Like the Soft Grip, the durable cast aluminum body is designed for use in tough industrial processes, and the ergonomic and comfortable trigger are ideal for hours of use. Aluminum extension are available, again in lengths from 6″ up to 72″, but feature a larger diameter for optimal flow and superior durability. The Precision, VariBlast, Soft Grip and Heavy Duty Safety Air Guns are ALL available with an optional, polycarbonate Chip Shield to protect personnel from flying chips and debris, further meeting OSHA Standard 1910.242(b) for the safe use of compressed air. Lastly we offer our Super Blast Safety Air Guns. The Super Blast Safety Air Guns are ideal for wide area blowoff, cooling or drying a part, as well as long distances. They feature a comfortable foam grip and spring loaded valve that will shut off the airflow if the gun is dropped. These units use our larger Super Air Nozzles and Super Air Nozzle Clusters, providing forces levels from 3.2 lbs. up to 23 lbs. Depending on which nozzle is fitted on the assembly, air inlets will range from 3/8 FNPT up to 1-1/4 FNPT. Aluminum extensions are available in 36″ or 72″ lengths. For help selecting the best product to fit your particular application, please contact one of our application engineers for assistance. When you work with us here at EXAIR, we strive to have all the ancillary items that you might need to make your installation a success, without having to find components at the last minute or perhaps using the wrong sized components. Each specific product line such as Super Air Knives or Line Vac air operated conveyors have specific accessories such as mounting brackets or plumbing kits which EXAIR has made to simplify the installation of those particular products. We also carry generalized accessories which work across all of the product lines so you do not have to use multiple vendors or purchase orders. Silencing Mufflers – Per OSHA Standard 1910.95(a), a worker must not be exposed to sounds levels above 90 dBA for any eight hour shift of a 40 hour work week. EXAIR offers several types of mufflers including – Reclassifying, Sintered Bronze, Straight-Through and Heavy Duty. For reducing the noise associated with an EXAIR E-Vac Generator, Vortex Tube, Cabinet Cooler System, or the exhaust air from cylinders, valves and other air powered equipment, we’ve got a muffler that will help to keep the noise level at an acceptable level. Solenoid and Manual Valves – The easiest way to reduce compressed air usage and save on operating expense is to turn off the compressed air to a device when it isn’t needed. EXAIR carries a wide assortment of solenoid valves, with offerings in the NEMA 4/4X classification, and supply voltages of 24VDC, 120VAC, and 240VAC. We also have manual ball valves from 1/4 NPT to 1-1/4 NPT and a foot operated valve, with 1/4 NPT connections. Swivel Fittings, Stay Set Hoses and Magnetic Bases – To provide a great degree of flexibility for positioning an EXAIR Super Air Nozzle, Air Jets or Air Amplifiers, EXAIR offers several items. The Swivel Fittings have 25 degree of movement from the center axis, providing a total of 50 degree of adjustability. The position is locked in place and holds until adjustment is needed. For applications where frequent re-positioning of the air device is required, the Stay Set Hoses are ideal. Simply mount the hose close to the application, bend it to the shape preferred, and because the hose has “memory”, it will not creep or bend. Lastly, the Magnetic Bases are another option for flexible, movable installations. The base has a on/off valve, and a powerful magnet to hold in any vertical or horizontal mounting arrangement. Hoses – EXAIR can provide hoses for your application. For the Line Vac air operated conveyor applications, we offer conveyance hose – a durable, clear reinforced PVC hose, in diameters of 3/8″ to 3″ ID, and lengths up to 50′. On the compressed air side, we can provide 12′ Coiled Hoses with 1/8, 1/4, and 3/8 NPT connections, and also 3/8″ and 1/2″ ID hose in lengths to 50′. Filter Separators, Oil Removal Filters and Pressure Regulators – Perhaps the most important accessories for use on a compressed air device are filters and regulators. Filtering the compressed air of dirt, debris, moisture and oil will help to prevent build up inside the EXAIR products, leading to longer service life, and less time spent cleaning, while providing optimum performance. Regulating the air pressure allows for tuning of the performance, using the proper amount of compressed air to obtain satisfactory results. If you have questions regarding accessories for use with any EXAIR Intelligent Compressed Air® Product, feel free to contact EXAIR and myself or one of our Application Engineers can help you determine the best solution. 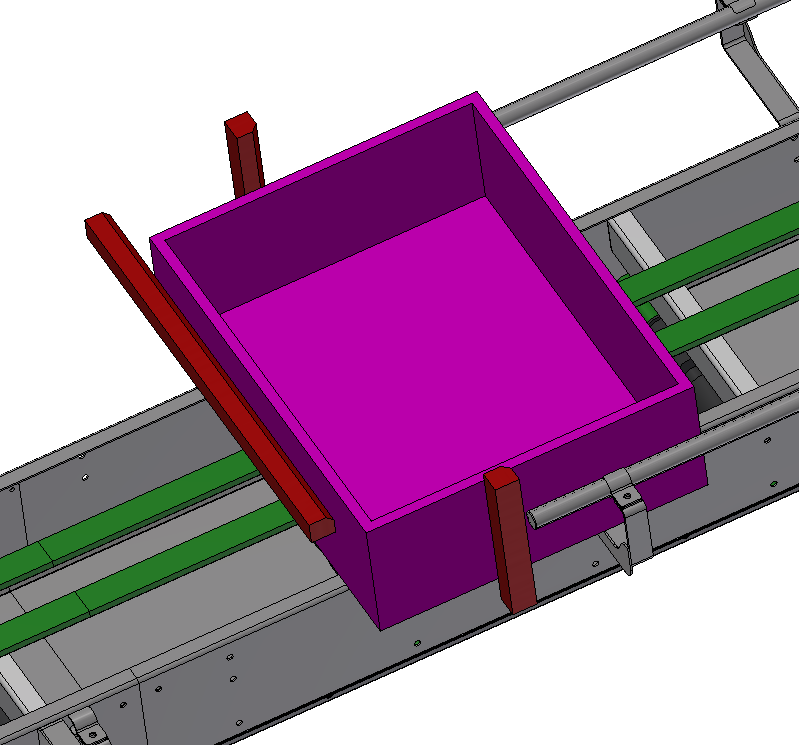 An OEM of crate washing equipment in Lebanon recently contacted me about an application on one of their conveyors. 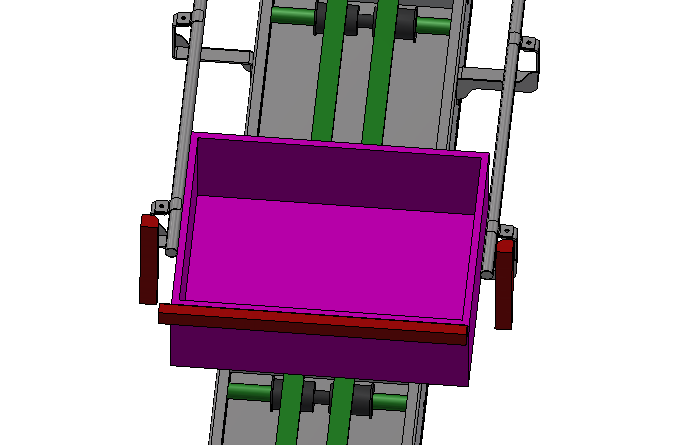 The conveyor carries a plastic crate out of a washer and excess water on the crate was presenting a problem in the application. 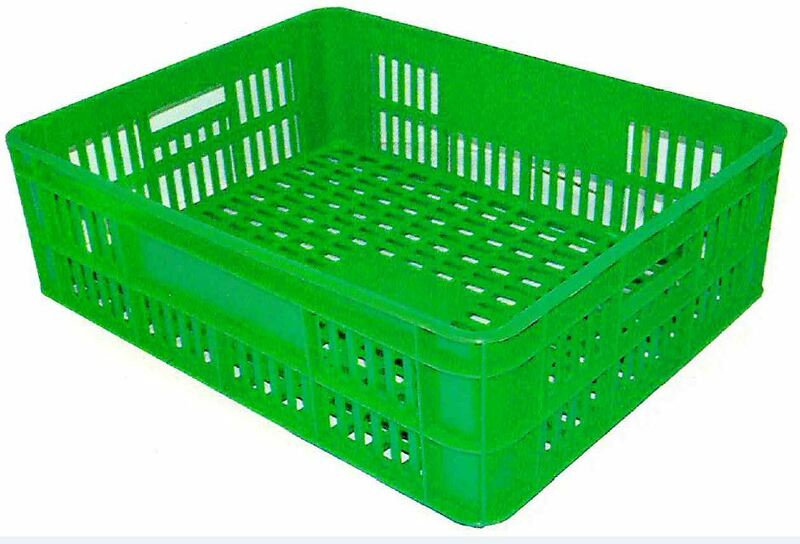 In order for the crate to move on to the next step in the machine, a blow off solution was needed, but the exit rate from the washer was inconsistent. In a given minute there could be 5 crates exit the washer, or there could be 20. So, the ideal solution needed to have intermittent control options with instantaneous on/off functionality. We immediately began discussing Super Air Knives, not only because we show plastic crate blow off in one of our many videos, but also because these units are instant on/off with full compatibility with a flow control device. Utilizing a flow controller, such as the EXAIR Electronic Flow Controller or PLC device, will allow for precise control of the blow off solution, limiting compressed air use to a minimum. The finalized layout for this blow off system. Click for a larger view. This layout utilizes (1) 24” Stainless Steel Super Air Knife on the top of the crate and (2) sets of (3) 2” Flat Stainless Steel Super Air Nozzles on the sides, held in place with EXAIR Stay Set Hoses. Notice the independent pressure regulators for the nozzles and the knife. This is to allow the customer to balance the air flows, because the 2” flat nozzles will create a higher force than the Air Knife when operating at the same pressure. In this application we were able to help a returning OEM solve their problem with the right mix of needed products. Exploring the problem and discussing numerous viable solutions led to the best fit for the application and customer. That’s precisely why EXAIR Application Engineers are available for any application call or question. If you’d like to explore an EXAIR solution we’ll be happy to help.